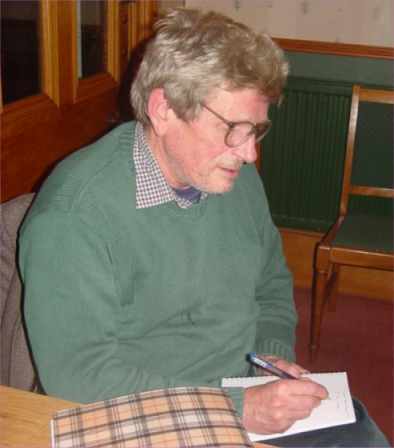 Angus Calder launched his latest volume of poetry "Colours of Grief" in Wick on 31 October 2002. After reading some of his latest poems Angus signed copies of the book for those who had gathered in the Breadalbane Hotel. His works has appeared in numerous literary publications including Chapman, Edinburgh Review, Fife Lines, Gaelforce 2001, Herald, North Words, Poetry Scotland, Scottish Poetry Library and Caithness based Scotia Review. Angus Calder's first book of poems "Waking In Waikato" appeared in 1997. He is based in Edinburgh and has received a Scottish Arts Council bursary in 2002 to work on his poetry. apart from other poetry publications he has written books - The People's War 1939 - 45 appeared in 1969 when he was teaching literature at the university of Nairobi. His next big historical work was a narrative of British expansion down to the 1780's - "Revolutionary Empire". Angus Calder was an interdisciplinary tutor at the Open University from 1979 - 1993. He has recently freelanced into military history and this accounts for much in "Colours of Grief". He has also produced books on T. S. Elliot and Byron and editions of selected verse by Burns and R L Stevenson. men, a works football team, in the new museum. in other photos prove it, in black and white. at hoochmagandie, unmarried, up in the moors. "Rab, I have to tell ye this - its finished here. Iv'e heard there's prospects in Canada. they seafared and in Edmonton Meg lives still.